I was born and bred in Dundee and currently live in Plymouth, Devon. I’m a member of The City of Plymouth Pipe Band, though no longer a player. The other day I was chatting to somebody who mentioned your web site. Having had a browse, it brought back some memories of the Jute Industries and Caledonian Pipe Bands. My mother used to work evenings in Bowbridge Works canteen in the early 1950’s and I used to go in twice a week, once to listen to the Jute Industries and the other to hear “The Cale” at their practice. 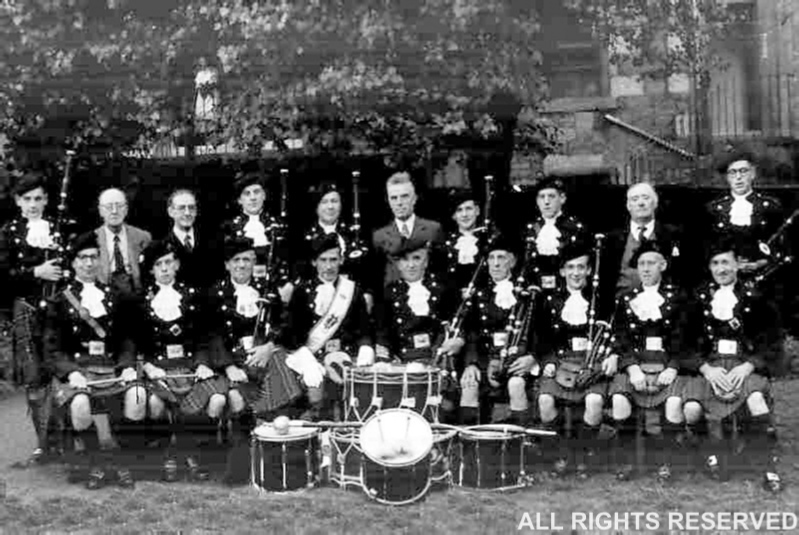 The names I remember from 1952, Caledonian Band, are Andy Malcolm, Billy Anderson (Side drummer), and Billy Baird (Tenor). Sadly Bill Baird was taken in a vehicle accident whilst serving with the T.A. They used to take me with them at weekends when they played at places such as Brechin, Forfar and Pitlochry to raise money for the band funds and gave me a spare drum skin to carry so that I felt useful. The fish supper afterwards was always great! I well remember PM James Sword when the Jute Indistries Band started and James White, their President. James lived in Canning Street and was machine shop foreman at Bowbridge. The detractors of the J. I. Band used to refer to them as the STOOR (dust) band. I can’t remember which tartan they wore but when they first started up, their uniform comprised a Balmoral, Blue battledress jacket, with tie, kilt and the usual plain hose tec. They used to taske a bit of a ribbing from the other bands about their battle dress jackets. Hope these little snippets of information are of some interest to you and I’m sorry that I can’t remember a bit more. I’m 70 now and if any more memory kicks in, I’ll pass things on to you.